2) Unique small business multi cashbook and reporting tool of the future that will be developed further soon! The SmartBank aim is to satisfy the markets needs in the accounting arena and continue to add new features that will make SmartBank an accounting tool that no accountant, bookkeeper or business owner can survive without! 1) A garage in Cape Town, processes 60 pages of bank statement a month. Using SmartBank, the owner has automated 90% of his transactions and now takes less than a day to process what used to take 4 to 5 days. 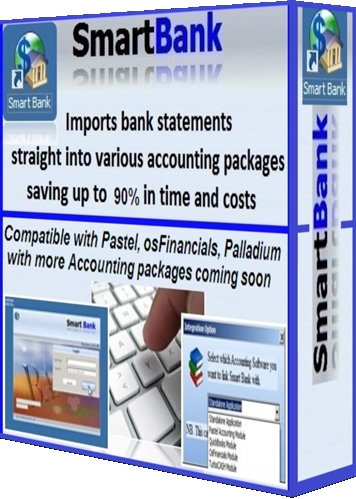 2) A big finance company in Johannesburg is using SmartBank to import over 6000 transactions per month for their 19 cashbooks into Pastel. SmartBank now significantly reduces the 3 to 4 hours a day that the manual processing used to take into less than an hour a day. SmartBank also assists in splitting a single transaction into 78 different general ledger accounts and more! TurboCash v3, 4 & 5 working beautifully!